If you should discover that your god loved others as much as he loved you, would you hate him for it? 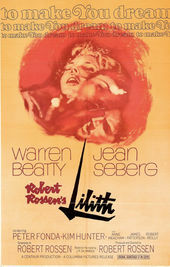 Upon its release in 1964, Lilith painted a confusing picture for American audiences. It was too expressive, too ambiguous, too abrupt, too raw. It also wasn’t what audiences had come to expect from writer and director Robert Rossen. By 1961, Rossen had directed nine films including Body and Soul, All the King’s Men, and The Hustler, all primarily focused on social concerns. Lilith was his final picture and something else altogether. With its emphasis on mood and style, the black-and-white Lilith drew on the French New Wave and offered a haunting departure. 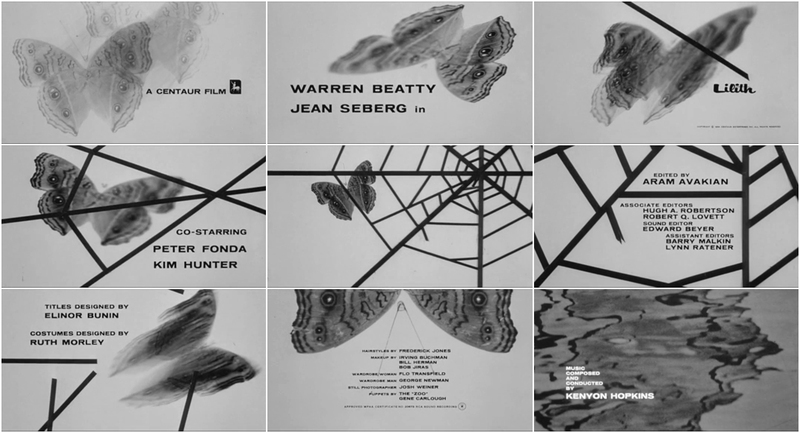 Jean Seberg delivers Lilith Arthur, the complex and brilliant title character, a woman wholly unhinged, who “wants to leave the mark of her desire on every living creature.” In the film's opening, title designer Elinor Bunin Munroe captures the strange energy of Seberg’s Lilith – a graceful and enchanting creature of seduction – with an ordinary butterfly. The butterfly becomes trapped in the stark angles of a spiderweb and then breaks free, echoing the narrative of the film. The graphic sequence is relatively simple, but it draws attention to itself, heightening the creative presence of the film. It takes the film-before-the-film approach and addresses viewers directly with metaphor. The sequence prepares audiences for the tone of the film and sets up its narrative themes, but also delicately posits the audience as subject. For 114 minutes, if we are willing and still, we are the butterfly, temporarily ensnared by another world.